The Dream by Gyleen X. Fitzgerald. A Magical Journey in Colourful Stitches. Aunt Hattie's quilt shop is full of gray calico fabric, and for Hanna that just won't do. Fortunately, the Good Fairy Gadget steps in and sets Hanna and her dog Bobbin on the Fabric Road to inspiration. 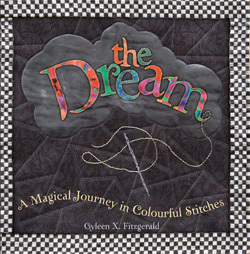 Join Hanna and Bobbin on this quest and you may just find yourself quilting your own Dream. The Dream includes patterns and instructions for making your own Dream Quilt. "The artistry of the quilting will enthrall the reader; the clear instructions to create one's own quilt will turn an attentive child into an artist." -- Kathleen Feeley, SSND, College of Notre Dame of Maryland.